First off, “progressive prosecutor” is just a falsehood. That’s not a thing that really even existed until folks like Larry Krasner started showing up as DAs in major cities like Philadelphia post-2016. Kamala Harris’s record as a prosecutor is far more complex than the “Kamala is a cop” meme suggests, but it is objectively not progressive. Opening her campaign with a provable lie like that really damaged Harris’s credibility on the left, hence the “Kamala is a cop” memes. But Senator Harris is another story. Now, her leftist evolution post-2017 is no-doubt suspect, as the job description of a politician basically is to be an opportunist, but she really does have some legit progressive bona fides. She was one of the first Senators to co-sponsor Bernie’s Medicare for All bill. She’s practically one of the only Democrats who can say they got something progressive done in the Trump era, with her criminal justice reform (why she is not constantly parrying “Kamala is a cop” with the First Step Act is beyond me, but I digress). She has a 100% rating from NARAL (a pro-choice organization) and a 7% rating from the NRA. Opportunistic or not, Senator Harris has cast some honest to goodness progressive votes (if you’re confused as to the difference between progressive and liberal, I wrote an explainer on that here). As someone who has also moved left post-2017, I would be a raging hypocrite to call Harris disingenuous in her leftist shift, but she must explain how it happened, and she has not really done so yet. “Progressive prosecutor” feels like she’s trying to merge the parts of her progressive Senate record with her not-progressive prosecutorial career, and paper over the fundamental differences between prosecutor Harris and Senator Harris. Changing your mind isn’t a bad thing so long as you do so thoughtfully and earnestly—in fact, it’s a good thing. People respect you more for it. As a public official running for higher office, Harris has a duty to explain her leftward shift. And yet, Kamala Harris still does not even have a policy section up on her 2020 website as of this writing. The closest she gets is copy/pasting her announcement speech which was heavy on rhetoric and light on details. 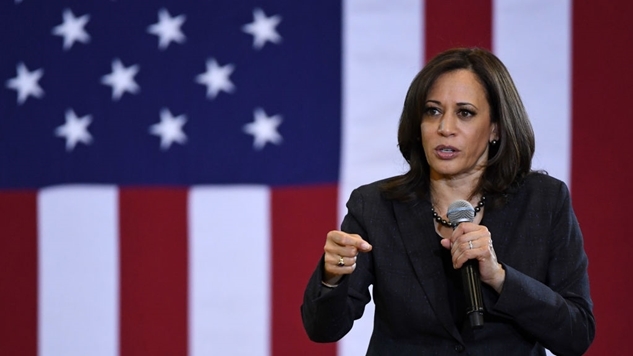 Harris is being very cagey about her views, and it’s hard not to look at this tactic as being directly in concert with the longstanding Democratic Party strategy of candidates being intentionally vague about their positions, so as to invite voters to project their political beliefs onto them (exemplified by the divide between the 2008 Obama campaign and the 2009-2017 Obama presidency). Kamala Harris has given leftists plenty of reasons not to trust her, but the question of whether we actually should trust her is a little more complex given the political realities that we all inhabit. She has staked out very public positions on Medicare for All and the Green New Deal—even going so far as to say we need to “get rid of” private insurance altogether (her partial walkback the next day was in concert with Bernie Sanders’ Medicare for All bill, in that it does allow for the existence of small supplemental private insurance while Medicare for All is being phased in). She has very publicly stapled herself to the central progressive legislative priorities in 2020. Even if Kamala Harris is being disingenuous in her leftist shift, she has still tangibly shifted left, and by endorsing these two leftist programs (that poll extremely well as is), she has told progressives that she plans to make us a part of her ruling coalition. I would not be writing this hot take with a pre-2016 Democratic Congress. Time and time again, the old guard of the Democratic Party caves to bad faith attacks from the right and major media, so the notion that they could hold a Democratic President accountable is hilarious. As the fight over the Affordable Care Act demonstrated, the only time most old school congressional Democrats ever rebuke Democratic presidents is to overrule liberal policy—like taking Obamacare from being centered around a public option and turning it into Mitt Romney’s health care plan. But in the age of Alexandria Ocasio-Cortez, power has shifted—dramatically. Progressives in Congress presently have more power than at any point in millennials’ lifetimes (although moderates still control the majority of Dem power in Congress). In fact, Kamala Harris herself was just part of a progressive push-back to the old guard, as she joined Bernie Sanders and Elizabeth Warren in defending Ilhan Omar from this ridiculous bad faith spectacle that Nancy Pelosi and Steny Hoyer almost gave into. In the age of the imperial presidency, we have forgotten how much power Congress has. It’s a lot. They are a co-equal branch with the executive, and in many ways, actually have more power to drive policy discussion than the bully pulpit sitting in the executive branch. Which means that if President Harris were to backtrack on her promise of single payer health care and a government takeover of major parts of the economy to stave off certain planetary destruction, and instead offered another Heritage Foundation-approved plan, there would be an uprising from AOC wing of the party—and good luck getting that neoliberal dreck through a divided Democratic Congress. From a politically and legislatively practical perspective, it is far easier for Kamala Harris to build a popular coalition around these two programs rather than to try to pull another bait-and-switch on the Democratic grassroots (but that doesn’t mean many powerful establishment Democrats won’t still campaign for another bait-and-switch). As Pelosi and Hoyer’s backtracking on this Omar resolution demonstrates, the leftist wing of the party has real power over the establishment, and congressional power is on the upswing. The political winds are shifting left, and given the power that the Democratic grassroots have demonstrated post-2016, public statements on the left are much more binding than they were in the pre-Trump era. In many ways, Kamala Harris has publicly and legislatively aligned herself with the progressive wing of the party. Whether we like it or not, she’s trying to court our vote, which means that we progressives have real power over two of the only three people who seemingly could be our next Democratic president, per current polling (Biden and Bernie being the others). It also means that whether she is genuine or not about her leftward shift may be of secondary concern, as it is clearly a political priority for her, which is her primary concern given that she’s running for president. Progressives should keep our guard up given the lessons of the Obama presidency—plus anyone endorsed by the establishment should be viewed skeptically—as the leaked DNC e-mails proved that powerful Democratic operatives like Debbie Wasserman Schultz will not hesitate to put their thumb on the scale. However, Harris wasn’t an establishment darling until very recently. Her political story is still developing, and progressives would be wise to hear her out given the power she is gaining every day in the party. Progressives have real, enforceable power over politics in this country, and anyone willing to publicly endorse two of the biggest, most ambitious policies ever introduced to the United States Congress should get some amount of credit. Comparing Kamala Harris’s 2020 platform to John Kerry’s 2004 Democratic presidential platform practically makes her look like a communist. In many ways, progressives have already won the 2020 Democratic primary with the Green New Deal and Medicare for All becoming frontrunner litmus tests. We shouldn’t outright dismiss anyone who wants to jump on board with our wildly popular movement that will only increase in popularity as the two largest, very liberal, generations in history gain more and more political clout. Progressives have serious power to affect political change in America for the first time in most people’s lifetimes. Let’s use it wisely.